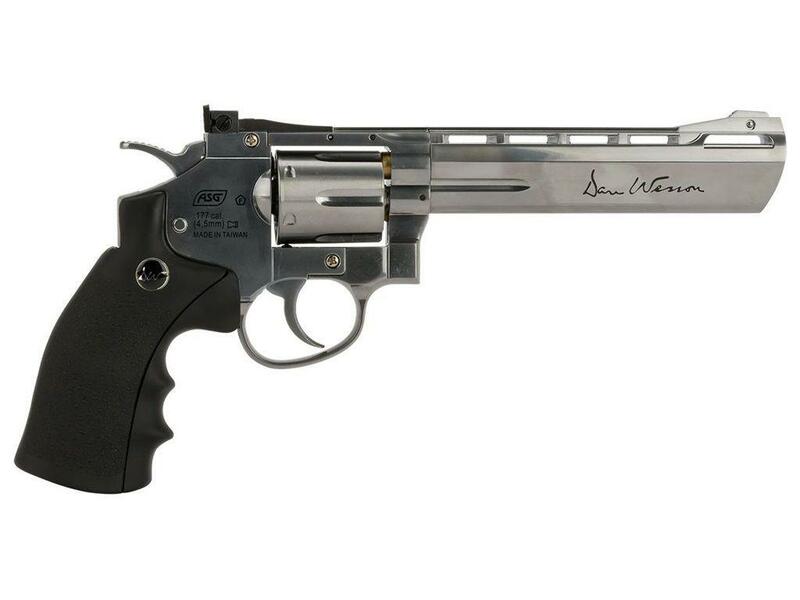 Buy Cheap Dan Wesson 6 Inch Silver Pellet Airgun |ReplicaAirguns.ca | Easter Weekend Sale! 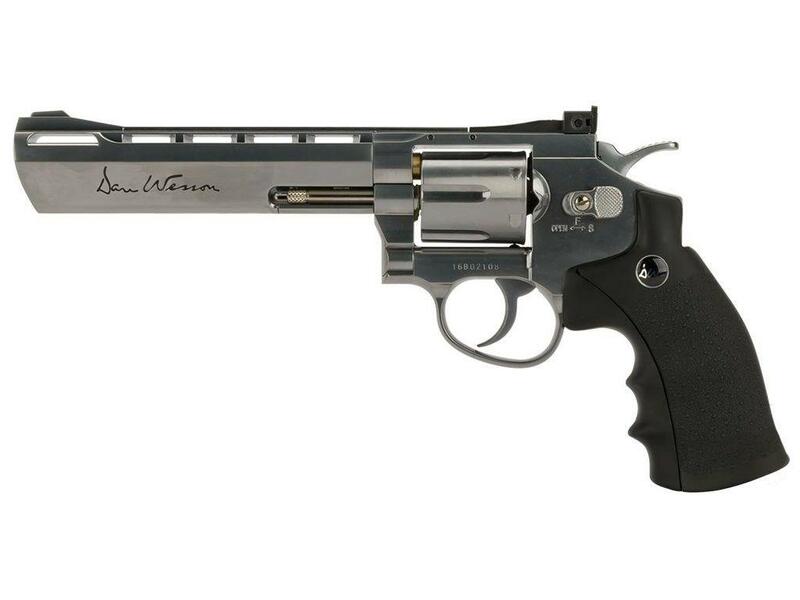 Trigger Pull: This ASG Dan Wesson Pellet Revolver has a predictable trigger with the single action being a bit more consistent since the take up is short, and the release is fairly light. Double action mode is very usable without a lot of extra pressure required. I found I just wanted to shoot this gun in single action mode because it felt more natural being that it is a six shooter. You also want to take your time shooting since loading the pellets into each shell and then the shells into the cylinder takes a bit of time. Accuracy: Based on the exceptional results I got shooting my Dan Wesson Steel BB versions from 30 feet away, I should be able to crack an inch or two 6-round grouping if my shooting is on. In terms of FPS performance, ASG claims the pellet versions to shoot around the same velocity as the steel BB versions. With that in mind, this should give the Pellet shooting Dan Wesson's the advantage for raw power, since the lead pellets are heavier than steel 4.5mm BB's. Realism: The ASG Dan Wesson revolver is as close as you can get to a real six shooter. Loading and ejecting actual shells into the cylinder makes you feel like this gun is much more than an unassuming airgun! If you want that real revolver experience than a shell loading Dan Wesson is the way to go, and the addition of a rifled barrel and lead pellets to the Pellet firing version should make the shooting experience even better. Beautiful in every way, only drawback is non snug bullets. I like everything about this one, I wanted a big, heavy, obnoxious hand held for cosplay purposes and this gun delivered. My only complaint is that I have a Crossman SNR 357 where I can spin the cylinder then slap it in for fun like they do in movies, games, or gambling games and it would work flawlessly. You know, when you put one bullet in and spin the cylinder and force someone to pull the trigger. The issue with this Dan Wesson is the bullets don't fit snug like my Crossman so when I do that with the Dan Wesson, the cylinder wouldn't go in cause the bullets kinda just slide out ever so slightly, so it prevents the cylinder from slapping in. For cosplay purposes it detracts from the fun, and sadly I've had more fun with my SNR 357 because that functionality works due to the bullets fitting super snug vs the loose non snug bullets in the Dan Wesson, would be perfect otherwise. I wouldn't mind the price if that issue was corrected with a revision in the bullets. I love the pistol, found pretty accurate, awesome weight and easy to handle but would love to know where I can get a laser site for it as you are out of stock still. Thanks much and have a great day shooting!!! The Dan Wesson honestly is a great gun. Verry accurate with more then 440fps. Aprox. However I believe that the 4.5inch would of been better for me. Gun is heavy but easy to get used to. Bullet like shells for you bbs give it a real gun feeling to it. Nice sound when shot and pulling the hammer. Long to load during range. Plastic handle is great but Verry flimsy when changing co2 cartrige. As a owner of this gun, I recommend you the 4.5". All feels extremely durable except for the plastic handle, but I'll sacrifice that for an easy to load co2 nob. My only complaint is that it is a tad too big for my hand, but I knew what I was buying so its forgiven. All in all I'm very impressed with the built and performance and would recommend for anyone who love revolvers! Very fun revolver. 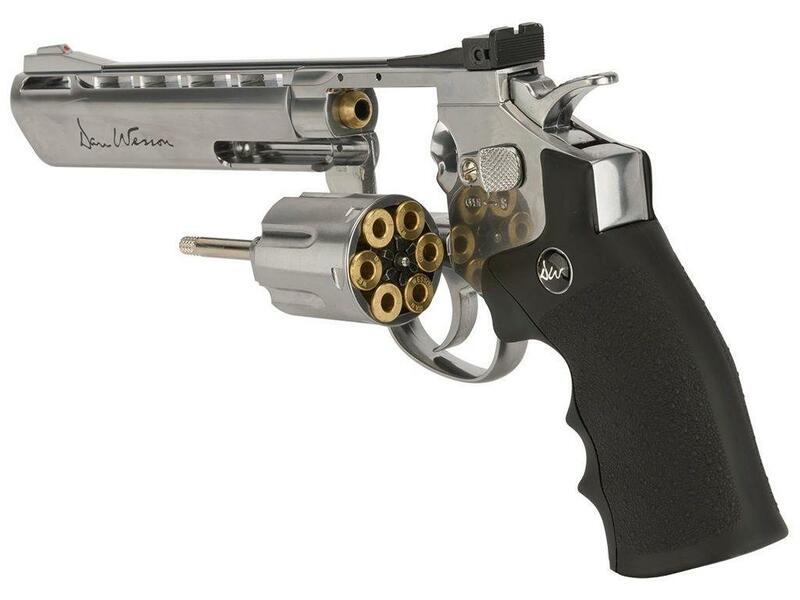 Just like all dan wesson models. The shells with pellets is innovative and actually fun to load up. Accepts most pellets that I have tried. You won't be disappointed.